When I was sixteen, I had a fantastic A Level Biology teacher. She was passionate about biology, not because it allowed us to understand technology, or because it led to a job in the STEM sector, but because she recognised that there was something intrinsically wonderful about this subject that she wanted to share. She was adamant that all her students would learn to appreciate the explanatory power of this wondrous subject, and we did. 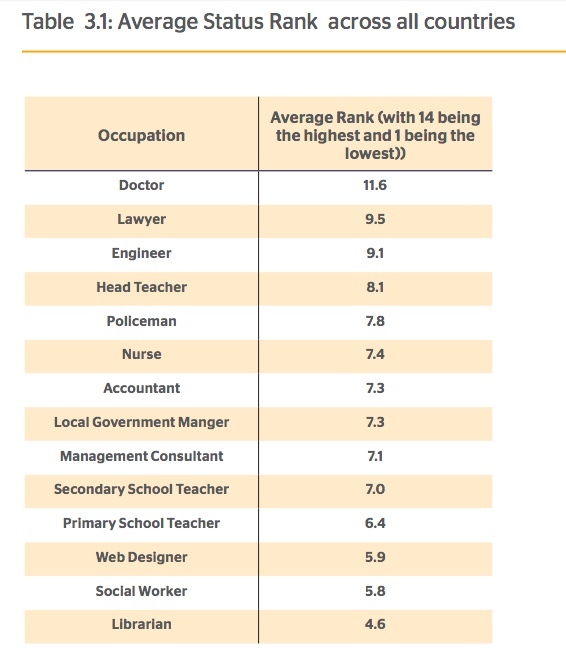 Role on twenty something years and teaching is considered to be a mid status profession: overall teachers are ranked 7th out of 14 occupations in the Global Teacher Status Index (2018). There seems a mismatch here between the perceived professional status of teachers and the important job teachers do. A teacher can have a transformative and lasting effect on young people in ways that other professionals can’t. Whilst the status of professionals is commonly attributed to salary, there is something else at play here: ‘anyone can teach’. My brother taught me to drive and my friend Philippa taught me how to rearrange equations. If anyone can teach, then perhaps we haven’t got a profession after all? A few weeks ago I attended a symposium at the UCL Institute of Education where we explored the role of knowledge in education. Michael Young spoke about students acquiring ‘powerful knowledge’ as being a primary aim for education. This knowledge is specialised knowledge that gives students the ability to think about, and do things, that otherwise they couldn’t. Young calls this powerful knowledge, not because it exerts ‘power over’ students, but because it gives ‘power to’ students. Powerful knowledge takes students beyond their everyday experiences by giving them access to knowledge from the academic disciplines such as biology, chemistry and history. For me, powerful knowledge in science gives rise to the big ideas of and about science that allow students to generalise and think about the concrete world in abstract ways: matter is mostly empty space, life evolves as a result of random processes and the Earth has no top nor bottom. Powerful knowledge necessitates ‘powerful teachers’. Powerful, not in the way that Young refers to knowledge, but powerful in terms of their potential influence in helping all students acquire an understanding of powerful knowledge and not just the privileged few. For as long as we come up with reasons to justify why some students should have access to powerful knowledge whilst others shouldn’t, we are in danger of depriving students who are already deprived. To conceive that evolutionary theory, or atomic structure, is only suitable for certain students, is to restrict powerful thinking to the few and underestimates what the teaching profession is capable of. And I am not talking here about drilling students only to be able to regurgitate a few disconnected facts for the exam. This isn’t powerful knowledge, this is fragmented, powerless knowledge. I am talking about the development and implementation of a rich set of evidence-based, subject-specific pedagogies, that work together to allow all students to access the curriculum in a way that allows them to participate in meaningful learning. When we think about teaching as a profession dedicated to getting all students to understand powerful knowledge, then teaching no longer becomes something that anyone can do. Instead, teaching becomes a profession that requires an in-depth understanding of the academic discipline (what we teach), and the knowledge of pedagogy, assessment and how students learn. Indeed, as Young alludes to here, it is because the pedagogy involved in helping all students to acquire powerful knowledge is hard, that teaching should be one of the most highly respected professions in the world.